What is ultrasonic manipulation and how can it be used in 3D printing? Ultrasonic manipulation uses ultrasonic waves for handling of a wide range of components and materials, which potentially enables the creation of a more versatile 3D printers. Because of the non-contact nature of ultrasonic manipulation, particles and components with very different mechanical properties and shapes can be handled with a single ultrasonic manipulator. Moreover, small particles in a submillimetre range and sensitive components can be easily manipulated (while this creates major challenges for mechanical handling approaches). What kinds of applications or products will this technology be used for? This technology provides a sort of “universal ultrasonic gripper” that enables the development of more general and versatile 3D printers that are capable of printing a wide range of materials and/or components. Such printers will be able to both assemble electronic circuits and deposit materials for additive printing, and therefore whole electronic devices can be printed – from the circuit to the case and everything in between. How will ultrasonic manipulation-based 3D printing technology different from existing printing techniques? Ultrasonic manipulation enables the creation of a much more versatile printer than anything on the market today. Current 3D printing techniques can only print the particular material they are designed for. With ultrasonic manipulation technology, printers that use almost any material, from metals to plastics or even liquids can potentially be built. And not only it will be able to print different materials it will be capable of assembling electronic circuits or mechanical systems from small components. How has this technology been used in 3D printing to date? As a demonstration of the technology we have built an early prototype that can assemble simple electronic circuits. We have created a video that describes this in more detail. The prototype uses an array of ultrasonic transducers for non-contact transportation and positioning of electronic components and a laser for soldering those components to a PCB board, also in a non-contact way. An on-board camera is used to coordinate the whole process, detect the PCB and component positions, calibrate the laser, etc. The current prototype can only handle components that are not smaller than approx. 0.5mm, but the use of higher frequency ultrasonic waves would enable even the smallest electronic components to be manipulated. Ultrasonic manipulation will become even more useful in the future, as the size of electronic components continues to shrink, which creates challenges for pick-and-place machines. However, if we want to create a more general printer, we still need to implement the deposition process of other materials or components. Do you have plans to commercialize this technology and, if so, what further development needs to take place? We believe this technology has tremendous market potential, but there is still a lot of research and development to be done before it will find its way to the creation of 3D printers and end-user products. For example, if we want to create a more general 3D printer, we still need to address things like component welding and dispensing approaches for the deposition process of additional materials and components. We are currently seeking partnerships that would help speed up the development and commercialization of this technology. Can you give us some ideas of other applications that you have considered for Ultrasonic Manipulation? In my opinion, most of research and development is focused on the application of ultrasonic manipulation in the liquid medium for cell sorting, cell patterning, single cell manipulation, etc. Most of current applied research on manipulation in air is also very specific and concentrates on containerless processing and analysis of chemical substances. However, we thought that we could bring all the benefits of a non-contact ultrasonic manipulation into a more general application such as 3D printing. You are seeking partnerships to help advance development and commercialization. What type of skills and resources are you seeking in a partnership? Who would your ideal partner be? - We are seeking partners that work in the 3D printing industry or other companies that see potential application of ultrasonic manipulation in their respective field. 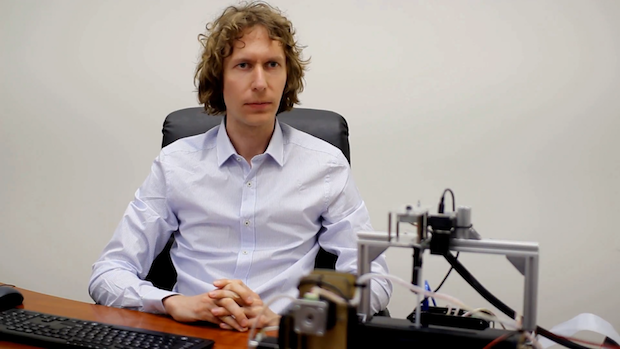 Osvaldas Putkis graduated from University of Warwick with a Master of Physics (MPhys) degree in 2010. He then continued his studies at University of Bristol and received a Doctor of Engineering (EngD) degree in 2014. His thesis research focused on structural health monitoring using ultrasonic guided waves. As part of the EngD programme he spent 2 years at QinetiQ Plc and worked on structural health monitoring and non-destructive evaluation projects. Osvaldas joined Neurotechnology in 2014 and started a project on ultrasonic particle manipulation which eventually resulted in the creation of the Ultrasound Research Group. His research interests now include non-linear ultrasound, ultrasonic particle manipulation and ultrasonic field modeling. Since 2015 he is also a lecturer at Vilnius Gediminas Technical University.